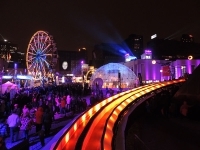 Montreal's lively 11-day midwinter festival is designed to bring some light and warmth into local lives and is said to be one of the largest winter festivals in the world. It is billed as three festivals in one, having gastronomic, musical, and artistic components. There are more than 100 concerts scheduled, more than 200 culinary and wine events, and various shows and exhibitions, many of them free of charge. Fun outdoor winter activities are also organised for the whole family. The festival attracts nearly a million spectators and foodies in particular await the event eagerly.